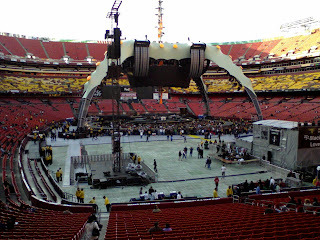 U2 graced DC again on Tuesday night with its timeless beats, charitable themes and a incredible UFO inspired transforming stage and light show. 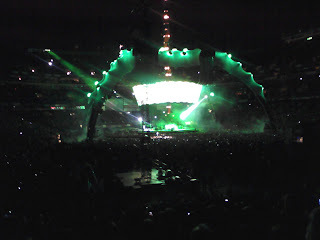 The massive stage hovered over the band like an alien spider, changing colors and intensity to match the music. The awe inspiring collapsible and circular LED display overhead could warrant and entire post to itself. Read more about it here at Architect magazine. European stars Muse warmed the crowd on this chilly night with a sound that was a mix of Queen and Radiohead. I liked their more mainstream songs like Starlight, but their other sets where too distortted for my taste. I did take kindly to some of their heavier bass lines that had a slight industrial tune to them. 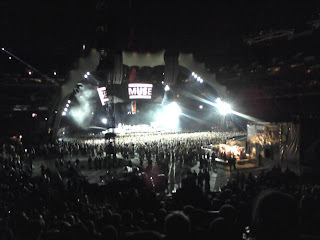 Bono lead the "nation state of U2" through a exciting and entertaining night that included a wide variety of songs from their 80s classics to tracks off their new album. Of course charitable causes were central to the show, ranging from freeing Burma (officailly Myanmar ) and supporting the Iranian election protests (the "Green Revolution") in their Bloody Sunday set. Bono might not be able to save the world, but he will definitely entertain you trying. Memphis 59 is playing at the Galaxy Hut tonight at 9pm with a great Los Angeles-based songwriter named Adam Marsland and his Chaos Band. Chris Zogby, formally from Boxcar Collision fame, is Memphis 59's drummer. It should interesting to see how the tiny Galaxy Hut contains the mix of rock/powerpop/indie soul tonight. 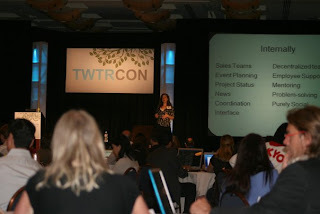 TWTRCON, the traveling convention focusing on the business uses of Twitter, will be coming to DC on October 22. The Grand Hyatt will be hosting the one day event which has 26 guest speakers, including Craiglist founder Craig Newmark. There should be interesting seminars and workshops, and I'm looking forward to attending. I've been happy with my limited usage of Twitter so far, and will be on the lookout of tips to improve it. Follow the convention on Twitter here. One interesting sign that the local housing market is starting to rebound in Arlington is the construction of new condos. I'm usually apprehensive about talk of new condos popping up close-by, as Clarendon already seems over saturated with dense residential housing like 1021, Station Square, Zoso, Clarendon Reserve, The Clarendon Apartments, and Phoenix to name just a few high rises. Plus with the new 10 story apartment tower going up at Clarendon Center I start to wonder if there is more supply than demand near this Orange line station. 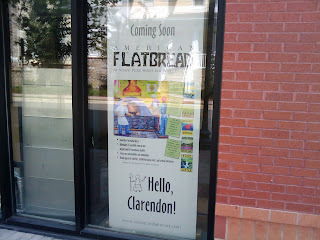 But Clarendon 3131 looks to be different than most new condos. It is several blocks south of the Metro station, which limits its height to only four stories. The proposed layout of the building is two four story townhouses that sandwich 16 single floor condos. I've been watching the construction continue along with some of my neighbors, and will be interested if the million dollar price tag for the townhouses will hold up at the end of the year. The annual Clarendon Day festival is coming this Saturday September 26! The all day event hosts live music, games for kids, art and crafts vendors, skateboarding and lots of food choices. Come to Mister Days Tuesday night for the kick off of "World Car Free Day"! There should be free food and door prizes, plus a small ego boost that you are supporting something Earth friendly. I think this is a great event for Arlington residents, especially with all the non-car transportation options readily available. 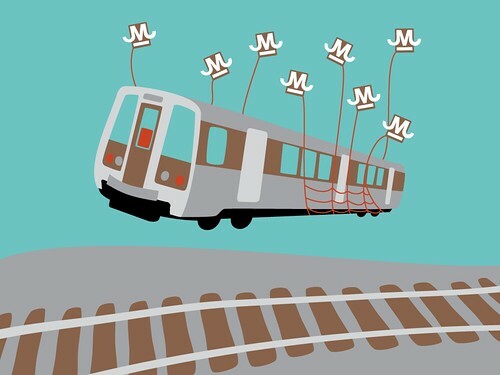 I know I am guilty of not using the so-closeby-I-can-smell-it Orange line Metro. 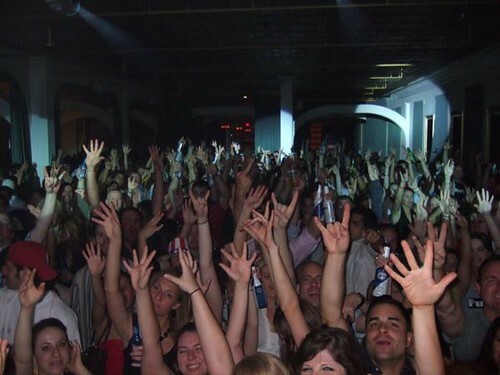 The second DC Nightlife meetup is happening tonight at Ultrabar. I missed their first meeting back in August, I wish I could attend this one to make up for it. There is an open bar from 10-12pm for Meetup members only. 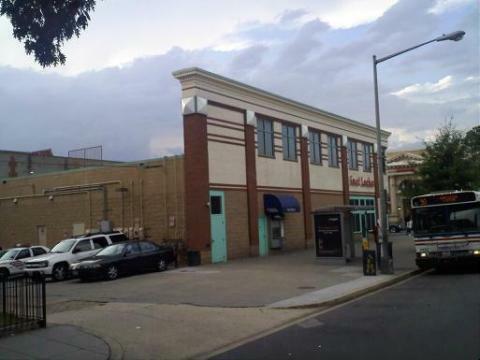 Ultrabar is near Chinatown and hasn't gotten the best reviews on Yelp. Actually, its gotten horrible reviews, and some are very entertaining to read. Yep that's what I thought. Not a surprise at all that Reuters is reporting that this area is crawling with wealthy young things. According to their research, Arlington VA is #2 on their list based on the density of 25-34 year-olds making more than $100,000 a year in the area. Washington DC grabbed the first spot and San Francisco came in at number three. Interesting that WTOP reported a similar article with Arlington also at #2 a few months ago, but all the other cities had different rankings. Brightest Young Things is having a ticket give away contest for the next Regina Spektor show. Her addictive sound will be making it our way on September 30th at DAR hall. 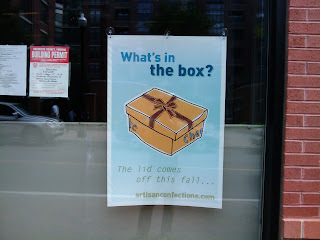 To win, post a video in the comments of this BYT post that is "at least as adorable as Fidelity." My entry is by the Raconteurs. "The Arlington County Police Department will close several streets on Saturday Sunday, September 20, 2009, for the 6th Annual Navy 5 Miler. • All access to Northbound Washington Boulevard from 395 at Exit 8B will be closed. • Access to Washington Boulevard from the 395 HOV ramp will be closed. • Southgate Road will be closed between South Joyce Street and South Oak Street. • Columbia Pike between South Joyce Street and the Pentagon will be closed. • There will be no access to Boundary Drive from Southbound 395. The race starts at 8 a.m. on Sunday. For more details about the race, visit http://www.navy5miler.com." I never imagined that new architecture design could be dangerous, but a popular firefighters' blog VentEnterSearch points this out clearly. 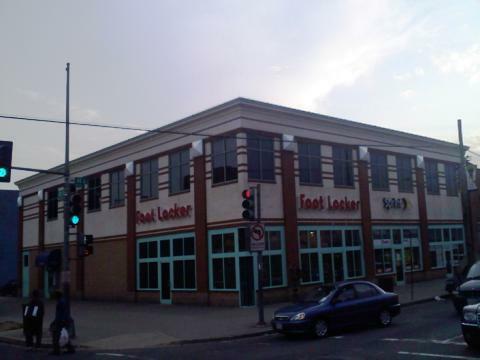 The pictured building is a remodeled light commercial structure that currently houses Foot Locker has a fake second story. Adding a fake facade is an old trick that allows a building to appear much more attractive, and thereby increasing foot traffic into it. But this also poses a serious challenge to firefighters in the case of the building catching on fire, since most building fires are combated by punching a vent hole in the roof first. It makes me cringe thinking of firefighters either trying to punch through the fake windows, or climbing over the parapet wall and seeing a 10 foot drop down to the real roof. I've never noticed it before at the corner of H and 8 street, just up the street from popular venues like The Red And The Black and Rock & Roll Hotel. I'm going to try to be more alert to safety angles of new architecture now. The 9-11 Memorial 5k race went on tonight in Crystal City without a hitch thanks to almost perfect weather. The race was heavily participated in with Army Navy Drive near the Pentagon being packed with both runners and supporters. Additional entertainment was provided in the form of a high school dance team, Redskin cheerleaders, and live music. Free pizza, hot dogs, water and beer was also provided to runners after the race! Congrats and thanks to all the runners! Once again, Paul has alerted me to another upcoming venue near the Zoso apartments and 1021 condos. A quirky little wine bar called Screwtop is headed our way thanks to Wendy Buckley. Wendy's story of how she quit her six figure job to follow her dream of opening a small business in Clarendon was interesting enough to make AOL's homepage Monday. She has an interesting strategy of trying to take advantage of the recession by going against the flow and opening a risky light commercial venue. 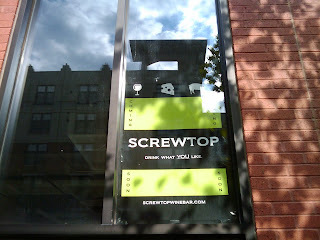 I look forward to visiting Screwtop when the eventually move into 1025 N. Fillmore St.
Photo credit goes to Paul Moon again. Thanks! Don't they realize the 9-11 Memorial 5k race is this Saturday in Crystal City, and many participants were planning on using the trains for it? Oh, and Metro didn't bother to tell us about this until Sept 1st, so it will throw a wrench into all those people who were planning on using the train to get out of the airport. Many local venues have a regular Wednesday night activity or deal to attract the weekday crowd. Several places have half price burgers or happy hour deals. Iota has open mic. RiRa has comedy standup. And now I've learned that Freddie's in Crystal City has ... Drag Queen Bingo? Its definitely a break from the ordinary in Arlington, with Freddie's being a beach themed and LGBT friendly bar. It's a fun and laugh filled night with bingo hostess like Ofelia Bottoms reading the numbers. The best part is when two people get bingo simultaneously, and Ofelia makes the crowd judge the winner as they "lip sync for their lives!" The free bingo games start at 8pm and the night also features half price burgers. Several new restaurants appear to be opening soon just south of the main Clarendon strip. Local resident Paul Moon was kind enough to pass along this tip and photos. The storefronts at the new Zoso Flats building at 1025 N. Fillmore Street are now advertising some up and coming restaurants. Two much-needed additions are coming to the neighborhood: American Flatbread (gourmet pizza) and Artisan Confections (high-art chocolatiers). I'm happy to see that area becoming more populated with light commercial establishments, as there is not much there currently besides Kinder Haus Toys. That block went through some growing in the past few years as Zoso was turned from condos into apartments, and I think these new restaurants moving in will help anchor that neighborhood a little more.